For the first time, the art world meets next week at Art Basel in Hong Kong. No wonder the city is of the incredible dynamism of Asia like no other. A portrait of the metropolis of seven perspectives. The gate with the swastikas is wide open, behind two trees with huge leaves shade the square before the temple. A lion guards the portal to the threshold may not replace it, because that’s bad luck. Heavy smell of incense hangs in the air, and in tall vases are lilies and sunflowers. After he has eaten his noodle soup, shown on the iBook the holiday photos, ignited three incense before the deity Yin and petted the cat lays Master Lo his Calvin Klein suit jacket over the chair and comes to the essentials to speak: the waiver and the Qi. The Qi is everything, the air force. You do not need more. Not all the shopping malls in the city. For what is the city? “First, the temples were. Then nothing long. “Then the British came with their brick houses. Both temples like colonial houses, small act today, “are almost impossible to see, overwhelmed by the skyscrapers. Then came the money. “It also came to the temple. “Not in my temples, but in the others. If you ask for advice there, they give you a table like a menu, and when you say your wife does not like you anymore, it costs so and so much. “Come often the case with the women. “Then the Chinese came. In the district over Canton in China, they have recently killed 200,000 turkeys thrown because of bird flu, and in the river that the fish are croaked. »The dead fish then came out here in Hong Kong, at the mouth of the Pearl River. Between Hong Kong and China – but not only there, one had to know – everything always depends on everything else, including the teaching Qi. “Seven sins of the Christians? We have twenty-eight gods. Divided by four is seven. You see, it all depends on getting along with everything. “So Master Lo said. Because they have the flyer, Pearl Lam runs out of the room, then it does a bang. It lies completely flat on the ground, surprisingly far away from the concrete block by Scottish artist at her gallery, she flew over the. She just has not told the Hong Kong would become completely disoriented as to whether they belong to the West or China. With its many glamorous parties in their apartments in Shanghai, Paris, London and Hong Kong and their two, soon three galleries in Asia, Lam has become one of Hong Kong It-Lady – for an it girl she is a few years old. Everything screams at her, their rough, over breaking voice, her purple hair that resembles a mop under power, even their squiggly desk with bold monogram. On her right arm emblazoned eight massive rings, a thick neck hickey. The fall she has survived. The orientation, she says later, slowly coming back. Her parents, who are among the richest property tycoons the city, they sent at the age of eleven to boarding school in England, then they should study accounting, she was not interested, but they did. She decided never to return to Hong Kong. In 1993, four years before the handover of the British colony to China, she returned yet. “We are an old Hong Kong family. But we are also a Chinese family. This means that you belong to your parents, as a property. You do what they want. This has nothing to do with my family in particular, which is the normal case. I wanted to open a gallery. My father said: I have sent you a decade to study abroad, and now you come back and want to be a peddler “? To save face, you have to show generous towards guests must buy things that others have, whether you like them or not. It does not contradict, especially any authority, because his true face against a supervisor can only do that if this does not incite his part to lose face. To face the truth of it, not to see the other in the eye part. But one does it, the other looks away first, then he gets mad. The Silas irritated. Faces have so impressed him that he has made it his job to look at her. 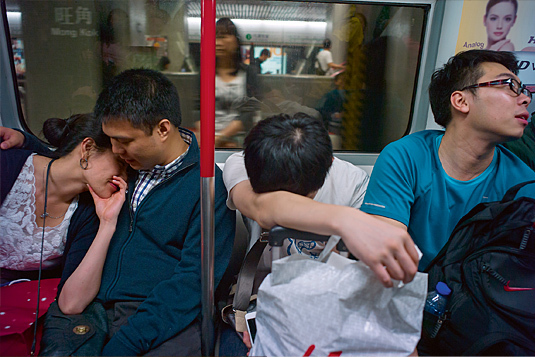 He fixed strangers in the subway has stopped the elevator in his house on each floor and filmed as the people were more angry with each floor, he films people on the escalator, while resting on a bench in the bus – wherever they feel unobserved and perhaps put their big city mask. Every morning he gets into the bus. On the expressway that leads on stilts over the water, pulls right over Kowloon, Hong Kong, part of which is on the mainland, on the left you can see the gorges of the residential towers in which live millions of faces, Silas’ work material. Previously this was a fishing village, but the city has piled up hundreds of acres of land to get new, much-needed housing. After half an hour’s drive Silas has arrived in the studio in Causeway Bay. If there is an increase of all the giant shopping malls that make up the city, then you can find them here, where hundreds of thousands are pushing every day between cosmetic, fashion and jewelry shops. With a beer in hand, Silas relies on a low wall in Times Square and looks. About half of those who push past laden with shopping bags, he estimates come from the mainland for shopping. The Chinese, says Silas, are not so easy for the layman to distinguish from the Hongkongern as it was a few years ago. This is about nuances – the men went rigid, wore black dress pants and vertex, are a bit smaller, they also smoked more and spat. The women, however, all have one thing that they always look so presumptuous. Satisfied with the face of the day makes Silas yield on the rooftop of his studio building another beer on. On the one hand, he sees the “Peak”, as they call the mountain, the 550-meter steep rises behind the skyscrapers in the clouds, and on the other hand, at the end of the row of houses, the racecourse, a legacy of the British. Over all, the fog, or smog, like the incense wafting in the temple. At dusk Silas returns to his narrow home, in the room with the table and four chairs, a sofa, a wardrobe and a plasma TV. Kitchen, bathroom and three bedrooms each measuring about four square meters. The interior walls are very thin. A girlfriend to take home is unthinkable. In such circumstances, Silas has purchased a sofa in the studio. Earlier, he dodged to the stairwell. There it is cold, but at night they were then usually alone, apart from the smokers and the old people who burn on the steps of gifts for their dead relatives. 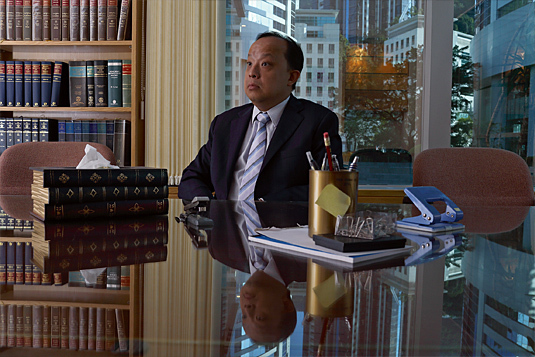 The business, which is on the way Kit Hung, has focused on two things: marriage and death. In Taoism, it is customary on certain days in the year to send the deceased to the afterlife items that will make their lives more comfortable there. The shipment is made by burning these things. The better they burn, the more likely they arrive at the receiver, which is why everything is made of paper. In the shop near the Lok Fu station in Kowloon there are watches, suits, rings, chains and “Hell Money” Money for hell. One can find phones of paper, multi-family homes, skyscrapers and airplanes Offerings, Louis Vuitton bags and the iPhone 5 There are eighteen levels of hell in which we as a rule does not stay forever, but a sufficiently hard life before regeneration maintains that one can use a little physical comfort. Taking it for a Hong Kong says kit, already must be hell, not to shop. Not that Kit Hung an expert in Chinese superstition would be, but in his new film will play a role in the issue, so he has researched. It will be his third film. Again, it’s about the search for identity. A daughter returns after six years back home to tell her parents that she will marry her Swiss friend. Parents who can not talk her out of the plan to arm themselves, as best they can with traditional practices against the stranger in the family. Married is finally in Europe – whether that will be in the film in France or Switzerland, it still depends on which country puts more money into the film promotion. For the wedding, the bride’s mother bought in the store for marriage and death needs a comb, a mirror, two bars and a ruler to measure the future grandchildren. Before the wedding the bride is sleeping with these utensils under the pillow, in the morning before she slips into her red dress, but there starting your pajamas, where they spent the night. If it does not, which is bad for marriage. It is also good for the box office – Taoist rituals, like everything Traditional come in well in the Chinese movie market. 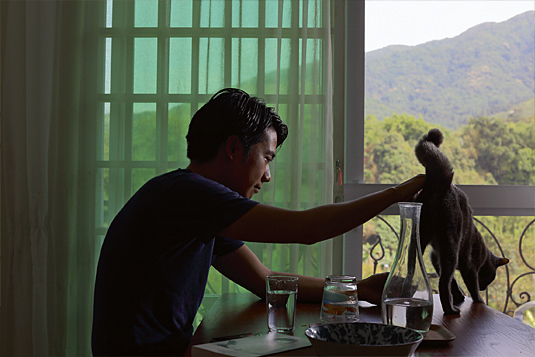 After his two first works, experimental cinema rather difficult, Kit Hung is now looking to the wider audience success. For the first time it’s not about the Hong Kong gay scene. Kit is gay, married to a Swiss – they are registered as the second gay couple in Altdorf in Uri. Soon he wants to move there, before he has to complete his work. It is a musical, like the producers, and before shooting begins, he is, as always, a few hours folding paper boats that require its employees to make the gods weighed. If he does not, the crew runs away from him – for fear of being hit by a lamp or to fall from the ladder. Anyway, it was not easy to come by good people. The great times of the Hong Kong film were the seventies, as on every street corner, a martial arts movie was shot and the city rose to become the center of the Asian film. Held, however, had the sense of the supernatural, with the kung-fu hero like Bruce Lee were equipped as standard. This sense has kept especially for architects. 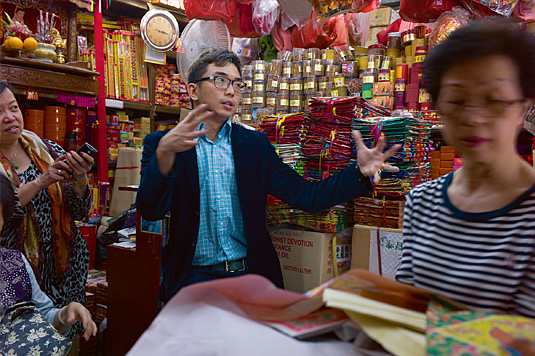 “Hong Kong is the most pragmatic city in the world. It’s all about making money as quickly as possible, as directly as possible. But when another skyscraper is placed in the skyline, giving the builders millions on feng shui consultant. “They make sure that the flow of energy, the Qi, right through a building and there are no stoppages or jams. Some skyscrapers have holes, others are weird angle in the landscape. Almost all of the fourth floor is not counted because the number four means death. The road trains, in which the small business is located, are among the few who have remained spared from the construction boom, with small vegetable shops, pawn offices and the street premises for the bubble in large boilers intestines, tripe and other offal wrapped in brown sauce. The somewhat secluded area near Lok Fu was a few years ago a kind of slum. Drugs, black market and crime flourished largely unheard in the roar of the planes that fell on the Kowloon Airport, once the most dangerous airport in the world until a few islands to the west of Hong Kong had to believe land was filled in and a new airport was built. Today the area is clean as the rest of the city, the streets are squeaky clean. Around the already growing thin needle residential and business towers in the air and come closer and closer to the old quarter. Hong Kong thrives on building, some say it is because perish. Hong Kong merely denies its revenue at a fraction of the income tax, which is about seventeen percent, and more theoretical maximum. The city earns money by providing land and leased it. The rush of Chinese investors has already made the real estate prices and rents among the highest in Asia, maybe even the world. Because space is extremely limited for the seven million inhabitants, the demand of mainlanders for homes, offices and real estate investments but is increasingly strong, the government and their boss who consequently Chief Executive means the economy Hongkong, decades ago it laid, the sea wrest land and artificially aufzuschütten. Even the British did so in the 19th Century began. In recent decades this practice has increased excessively. Alone until 2000 were added 62 square kilometers of land, equivalent to four times the area of ​​Geneva. Li demonstrates the latest case in a photo hanging on the boxes on the wall. It shows an aerial view of the central part of the coast of Hong Kong Iceland with the districts of Central and Wan Chai. Excavator rank well on the hundred-meter-wide strip of sand was heaped up with the argument that the better build a relief road for the overburdened road network in the underground. The site itself should be land for offices and luxury hotels. Li complained, because he saw an injured law, which referred to Victoria Harbour urban coastal area between the island and the opposite Kowloon country can only be gained if it serves the public good. The Supreme Court saw this as well and determined that the heaped area would be made available to the public as a park and decreased from 380 to 23 acres. Gritting his teeth, the government had to give in, as in 2003, when she thanks Chu and Li ever had to forego revenue on 200 acres and thus to many billions. Chu, who had established a foundation to protect the Victoria Harbour joined a little later by the Chair of the Foundation back because his family was threatened. The financing model of Hong Kong by getting new land reclamation had gone a good long while, but it was also all been clear that it had to be changed slightly with time. “If we had done so on, the sea would be only one channel, a flow between Hong Kong and Kowloon Iceland on the other side within a short time. The port is Hong Kong, Hong Kong’s harbor. <Hongkong> Means <duftender Hafen>. We need fresh air. The port is the lung of the city, and everyone needs fresh air to breathe. 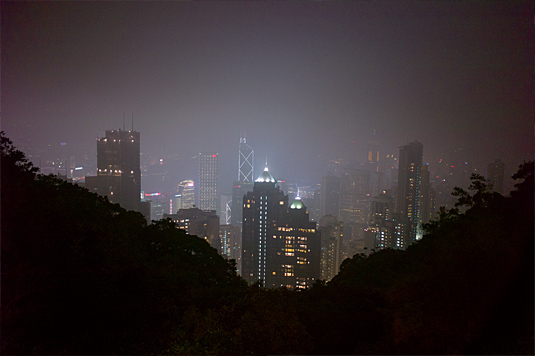 “Air pollution in Hong Kong is already one of the highest in Asia. But much more persistent than the asthma in the lungs of residents held in Hong Kong had the attitude that it is wrong and harmful to tangle with the authorities. “We have a saying: The poor people never fight against the rich people. And the rich people never fight against the government. I was once invited to dinner by a group of businessmen. They told me: <Dennis, we support your project so wholeheartedly, but we can not openly oppose the government. Do not be in trouble with the government, Dennis, is detrimental to business> But over the years, especially after the handover, some deliberately.. This is now our country »If Hong Kong is no rule of law, which they have inherited from the colonial masters, Li had, as in China, had no chance with a lawsuit. Strange wild acts as the land between the pristine hills in the north of mainland-Hong Kong, only from time to dive in confined solid ground, sky superior to satellite towns, such as islands. It goes past Fo Tan, the former industrial district, where once all the toys and sweaters were made, the “Made in Hong Kong” made a synonym for cheap goods before the factories migrated to China in the eighties. Then comes Tai Wo, which is halfway from Central Hong Kong to the Chinese border, twenty kilometers from here. After half an hour’s drive into the green New Territories one might have expected to get off at a small station in a market place. However, like any MTR station, whose name “Mass Transit Railway” is a day in the face of two and a half million passengers with suitably chosen, and this is a gigantic shopping mall. Kwan Sheung Chi lives with his wife and two gray tomcats in a two family house on the outskirts of Tai Wo Its Japanese designer furniture go a little under where to small living room and next to the voluminous chair without legs, who, however, no chairs, but a fully automatic foot massager – one of the many essential electrical appliances in a household Hong Kong. Like most also attracted out of town in the New Territories, to afford the rent, also because of the peace and better air. That they move into the area of ​​operations of the Hong Kong Mafia, they had not expected, however. If you walk from the house toward the river, where some of the houses are one-story stone with large transom windows, you can see all the bamboo scaffolding, which are raised here as the lower but also the high-rises further back. But not for all – in contrast to Iceland and Hong Kong in Kowloon, it is possible in the New Territories to have their own land and to build up to a certain size, it also explains Chi. This privilege applies only to those living in the Territories for at least fifty years. This has two reasons. First, it is in the Territories in another country right questions, because they were added later to the British Crown Colony. 1898 leased it for 99 years, the country of China, which had grown over time so indivisible in Hong Kong that the British in 1997 not only the Territories, but also Kowloon and Hong Kong Iceland gave back to them, even though they absolutely should not have had to. On the other hand, there were various stages of immigration from China to Hong Kong. 95 percent of the people of Hong Kong are Chinese stocky. On a small bridge over the river Chi shows an inscription that recalls the Chinese settlers made this place arable. The largest influx there was during the Chinese Civil War, which raged for 22 years until 1949 and ended with the victory of Mao’s Communists over the Nationalists under General Chiang Kai-shek, who fled to Taiwan and established the Republic of China. Inferiority were the Triads, an organized mafia gangs in association to flourish under Chiang Kai-shek took refuge after his defeat to a large part of Hong Kong. Tens of thousands of Triad members came back in the colony in which they soon controlled the drug trade, prostitution and the police. Many settled in the New Territories, and there has since enjoyed special rights. 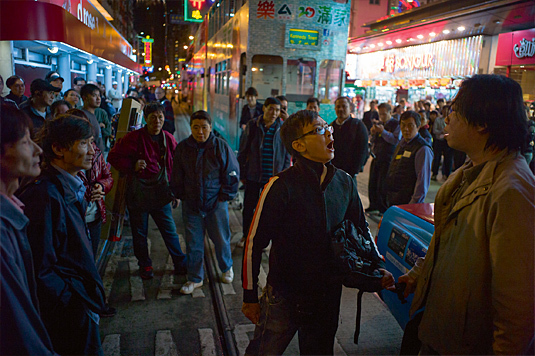 Chi got to feel these special rights when he protested against the demolition of the nearby village of Choi Yuen, which will give way to a new MTR station. The station would be better invested elsewhere, but a landowner did not want that, so the fifty farmers had to believe that enjoy no land rights. Never, says Chi, the government would mess with one of the landowners, because the network is large and extends to the tips of politics and administration. Behind a poster with a grinning real estate tycoon increases chi in the body shop of an apartment building, very close to his house. As soon as he is inside, a man comes running, the yelling at him and asks who he sniff here. That, says Chi, was one of the men in the Triad area. He lives in the same village, and all know that he is building this house illegally. The authorities do nothing to him, you should not mess with him. “Today, they no longer shoot, but they have other methods. 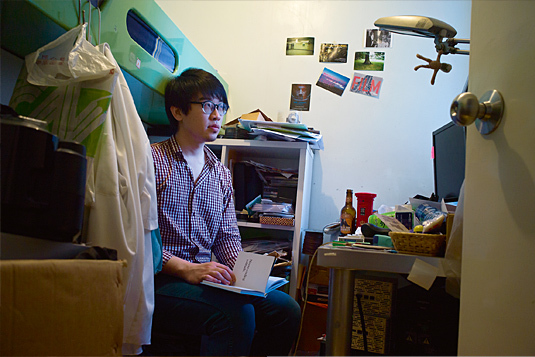 The most painful that exist in Hong Kong, is to throw someone out of his apartment. “Because rents are rising and rising, and also make it the Triads. Meanwhile, after hours of bloody gang fights, the Triads have learned and cooperate instead of fighting. Scotland Yard, it is one of the biggest criminal organizations in the world, with headquarters in Hong Kong. Worldwide wrap and protection money from drug stores and earn billions. Hong Kong is an ideal place for people who have the problem of having too much money. It’s not just about being on a Wednesday evening in Happy Valley it, it’s about where you sit on a horse race at the Oval stadium of the competition. Whether on the ground stands for ten Hong Kong dollars admission – a twenty francs – whether in the Adrenaline bar with cocktail catering for 400 Hong Kong dollars, or in the VIP rooms for members, where it is a bit more expensive, strictly speaking 400 000 Hong Kong dollars plus an annual fee of 20 000 But these are all still peanuts. After all, some would give anything to be in the right places there. The Hong Kong Jockey Club, which operates the racetrack in the city and another in the Territories, is not only the richest sports club in Hong Kong, China or Asia but in the world, with annual sales of approximately ten billion dollars in just 23 000 members. Real Madrid and FC Barcelona will be over 500 million. Pearl Lam who is familiar in the upper echelons of society, has the order of those who determine and Hong Kong, so named: in the first place, the banks, in the second place the Jockey Club, third the government. Where pretty much anyone who has power at HSBC or the government also has a membership card of the Jockey Club. Bill Nader is the head of the racing association. Six years ago, has him in New York, the request reaches to Hong Kong, and no question, he says, it was for him as pledge. He should Hong Kong, he says and laughs wide, and then he pulls the sleeve of his jacket long, from which protrude the cufflinks with the U.S. flag. Everyone in the racing business knows that the Jockey Club has the best race, the highest prize money and the fastest horses. This has two reasons: Firstly, the enthusiasm for horse racing has traditionally been large in Hong Kong, but in no small part because the Jockey Club has a monopoly on horse betting, next to the monopoly on football betting and for a lottery, and not only in the city but for the whole of China. Secondly, the association is so high hurdles for the prestigious membership – without you is not really arrived in the Hong Kong society – that candidates are willing to spend millions of dollars on the best horses, then, of the expense of the holder, in the stables Clubs are supervised. The really great thing about the club is but says Bill, “that there’s much more to drinhängt,” and that is certainly true. The association is in fact the largest taxpayer in the city. Would decrease the betting revenue and the club therefore pay less taxes, the taxes for the whole of Hong Kong would have to be increased, which in turn did not like the business elite, which in turn sits on the board of the association. In addition to the taxes of the registered non-profit association further assumes a large part of social spending in Hong Kong, funded kindergartens, playgrounds, schools and the university – a good argument not to touch the betting monopoly. If you had to draw an organizational chart of the city, the Tribune House of Happy Valley would offer the ideal template: In the middle of the eight floors sit Voting Members, an elite circle of decision-makers in Hong Kong, in their private boxes. Her interest in horses, as even Bill admits, is not necessarily huge, but on a race night are all nearby, with which it is to discuss things in peace, in the upper floors, with oysters, flown in from France Michelin chefs, feed the regular members, with spectacular views of the giant lying in glistening oval flood light, rising in the eight races this evening with a profit distribution to the winners of over seven million dollars. One floor below sit the horse owners. For them there is an express elevator specially built into the facade, so that they are after a race in time down to shake the hand of the jockey and receive a check for half a million. The name they give their horses about “Call me Achiever” or simply “trillion”, you realize the ambitions of this class of members or the fact that they still want to go where the other members who needed no horses, already are. The Chinese and expatriates: Finally, at the bottom, next to the thinning of overgrown grass peat railway, two varieties of Hongkongern who have almost nothing to do with each other in life mix. The Chinese tend to be older, have the newspaper with the race analysis on your knees and races between betting agencies and bleachers back and forth. The expats from abroad are in the majority whites, which are for a specific time in the city, mostly good money in banking or trading and feel in the beer garden atmosphere where in Heineken tents flows abundant stock, a little at home allowed. There are even fish and chips with beer. Jin Wong sitting in front of a large basketball court Prada sign in the lobby of the landmark on the edge of a small fountain. The Landmark is among the myriad of shopping malls in Hong Kong, the most elegant and exclusive, even though there is only ever the same juxtaposition of Gucci, Louis Vuitton and Dior here. Jin has just returned from work, the “South China Morning Post”, as it makes the marketing for the education pages. She is wearing a mint green jacket, an aubergine – not, as she emphasizes, black – skirt and yellow heels. Jin writes the best blog of the city, he called Hong Kong Girl Talk. Most of the others are written by expats, and usually they are about how horrible it was to live in Hong Kong, and how stupid people were here. Jin does not write about how stupid are expats (although she thinks), they primarily analyze the herd behavior of young women. Women in Hong Kong, said Jin, are in a peculiar position: be confident and arrogant like princesses that men are afraid of them. They are good, often better educated. And yet only focused on a single goal: to make a good marriage as soon as possible, which is why she wore make-up, the skin pale and Hello Kitty Sew kittens to look like a cute girl. The parents supported by the forces. Although they want their daughters to go to university and study economics, but above all, so they get to know guys there. In love with a girl in high school, the parents saw not so much, but they give up her job because she has found someone who earns enough money that the hand perfectly fine. “The real problem is that the girl in such a focus on being ready for marriage, that they stultify it.” Jin speaks in short sentences, clear, determined and hard. 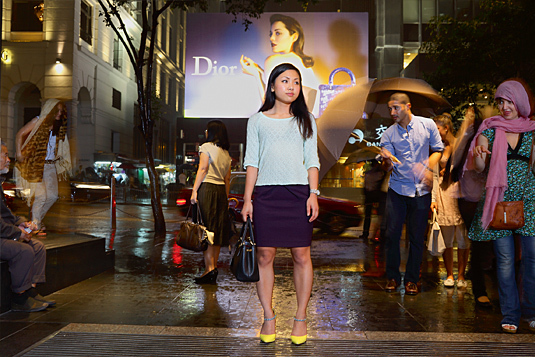 She says: “I am just an ordinary Hong Kong Girl.” And maybe it’s the really. She is 24 years old and single, a combination which, as she says, although actually banned in Hong Kong, on the other hand also common. 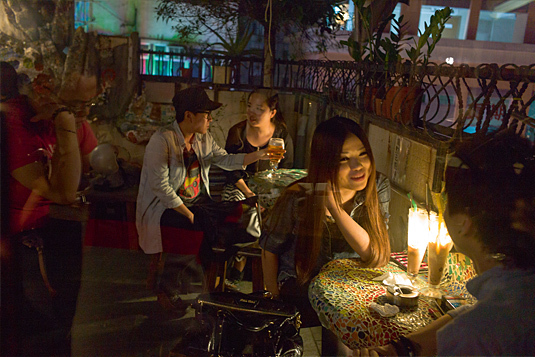 Unlike in the rest of China in Hong Kong sixty percent of women over forty percent are men, with a large proportion of men to women in China holding out because they simply do not earn enough to attract the interest of a woman from Hong Kong can. So Jin also waiting for a man she meets, and is also waiting on a man, as a being able to meet her. However, with the wait knows you are in Hong Kong, even Jin himself knows from excellent. On her blog she created a typology of waiting, divided into two groups. Once there is queuing for something you’d like languages, but they may not show up. As an example, she has photographed a line at McDonald’s, were distributed as a free burger. The people keep newspapers and iPads on the head, because it is bad manners to want something that costs nothing. You would lose his face. The situation is similar with the begging for the favor of a woman or a man. The other group, however, shows himself willing and smiling broadly at the camera. 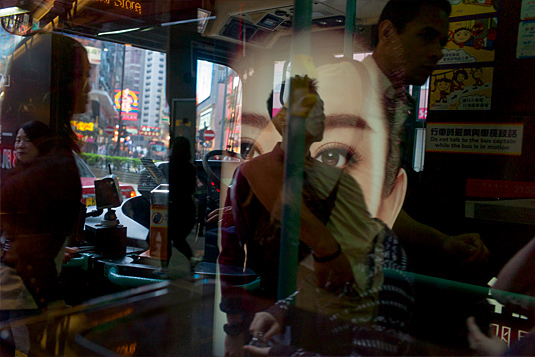 There are people that are waiting in front of a Prada store, as happens every Saturday at the Canton Road in Kowloon. Most are upcoming Chinese who fly for the weekend to Hong Kong to buy luxury bags cheaper without the high Chinese tariffs. But the crowd to mingle many Hong Kong. They are not, because they necessarily want to buy a bag, but because it is good and right to be here, where the money is because they give to understand it, to belong to the standard. So full, loud and hectic, the city is basically but its inhabitants are all waiting and standing in: the men with women, women with men, the Chinese shops from Hong Kong, Hong Kong before the Chinese business people. Pearl Lam waiting for her Chinese passport, Chi to justice in the New Territories and Silas might just be the next beer. Kit Hung waiting for the film promotion, Dennis Li at first directed verdict of Beijing. The Jockey Club they stand before the Oyster Bar, and Master Lo would say that everything is connected with each other. Because everything is qi.